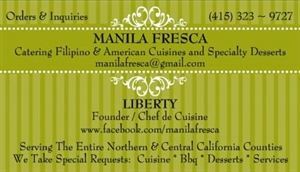 MANILA FRESCA: We Offer A Variety of American * Authentic Filipino * Italian * BBQ * Specialty Desserts * Lemon Bars, And Candy~Sweet & Dessert Buffets (415) 323 ~ 9727 Email: *NOT DISPLAYED* Please FIND US, MORE PHOTOS AND OUR MENU ON This Social Media Avenue ((FACEBOOK)) http://www.facebook.com/manilafresca BUFFET STYLE Has Been Very Popular With MANILA FRESCA. Our Food Is Very Tasty and Full of Flavor. We Serve A Lot Of Food And Do Not Skimp On Quality Ingredients. We take 'SPECIAL REQUESTS' and will do our best to accommodate your event We Deliver, offer Set Up and Clean-Up (Fees Applies) and flat-rate fee catering packages. Thank you for the opportunity to serve you and we appreciate your business. We look forward to your next event.